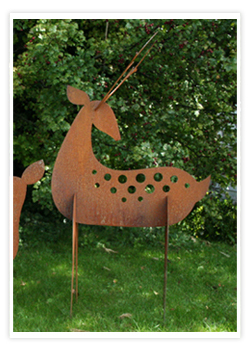 Here is the stag of our family of deers, made from high quality steel and coated in a rust effect. The stag would look great on it own or with its family. This would make a great border sculpture or lawn art. Unlike other steel deers, The Stag comes flat pack and easlier slots together without screws or bolts. On most products we have a 3 - 5 day delivery policy. We also offer a next day service on selected products. Call for details. You're welcome to collect from us. Please place your order over the phone on 01763 261781 and our sales team will arrange a collection date with you.